Watch eight minutes of new footage. 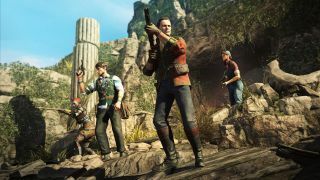 In case you missed it at E3, Rebellion's Strange Brigade is a co-op focused shooter set in a pulp 1930s world where supernatural monsters are very real, and they're coming to get you. The potentially problematic premise sees four agents of the British Empire travelling the globe in an effort to curb supernatural threats, something they achieve by battling mummies, minotaurs, ancient tribespeople and more, in an arcadey, over-the-top manner that recalls the developer's Sniper Elite: Nazi Zombie Army series, or Tripwire's Killing Floor. We were shown a brief glimpse of the game at E3, but here's a longer video, complete with developer commentary.